Dave Matthews Band has announced a free star-studded show on Wednesday, September 6, for “peace, music and unity,” weeks after the Charlottesville, Virginia rally, which killed counter protester Heather Heyer after a white supremacist crashed his car into a crowd. The Grammy-winning band was founded in Charlottesville in 1991. 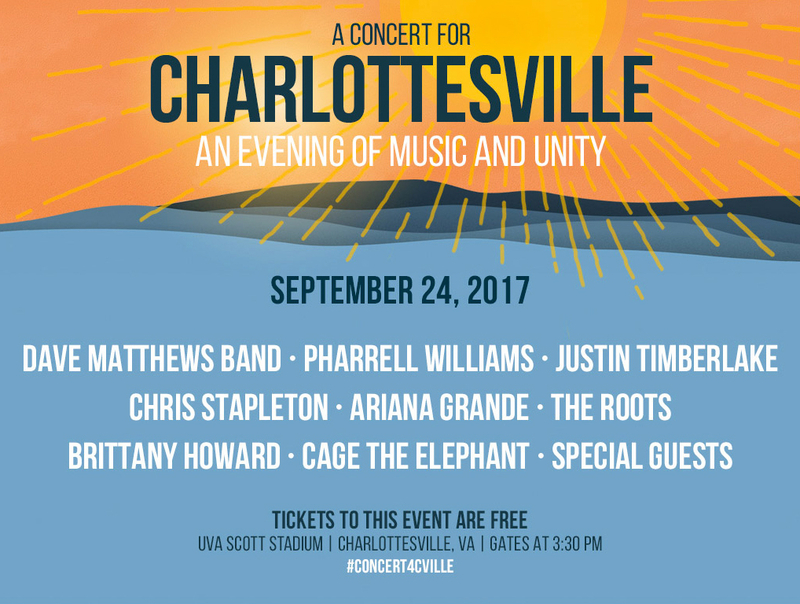 “A Concert for Charlottesville” will take place on Saturday, September 24 at the University of Virgina’s Scott stadium, and feature performances by Dave Matthews Band, Justin Timberlake, Ariana Grande, Pharrell Williams, The Roots, Chris Stapleton, Cage the Elephant and more. Doors open at 3:30 p.m. Residents of the greater Charlottesville area and UVA students, faculty and staff will have priority for the free tickets, which can be requested online until Monday, September 11 at 12 p.m. ET. A limited number of free tickets will also be available for walk ups at the John Paul Jones Arena box office on September 15, at 10 a.m. ET. Although tickets are free, attendees are encouraged to donate to the “Concert for Charlottesville Fund,” which will benefit the victims, families and first responders. Grande, 24, also recently organized and headlined the One Love Manchester charity concert, which raised more than $13 million for victims of the terrorist bombing during her May 22 show at Manchester arena. For tickets, go here. Fans can tune in at musicandunity.tumblr.com beginning at 5:55 p.m. ET on Sunday, September 24, 2017, as well as via other Oath brands including HuffPost.com, Aol.com, Yahoo.com, BUILDSeries.com, and on other social media platforms.